Carpets and upholstery take a beating everyday with general usage taking its toll - a regular and comprehensive carpet and upholstery cleaning and maintenance programme will not only provide a clean and comfortable living environment, it will also extend the working life of your furnishings. Our carpet and upholstery cleaning services in Northumberland and Newcastle Upon Tyne removes spills, spots and stains, as well as neutralising smells and sanitising. We use hot water extraction cleaning as it is regarded as the most effective cleaning method for stain removal and deep cleaning. 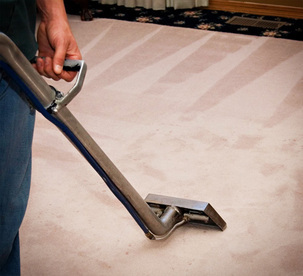 Hot water extraction involves the injection of a fine jet of hot water and cleaning solution into the carpet/upholstery, which is then immediately extracted back out with the dirt and grit. Our cleaning agents leave very little residue and subsequently re-soiling is no longer the problem it was in the past. Our products are completely safe to humans and animals, and are environmentally friendly. Carpets cleaned in bedroom, living room, stairs and landing. No fuss, got on with the work, I am very happy with the finished results. Two bedroom carpet cleaned and a living room carpet. Excellent and very thorough job. Sofa looks brand new. Mark was professional throughout the job he was polite respectful and very informative. Marks work is excetional my carpet looks new I highly recommend him. Looking for a Carpet & Upholstery Cleaner in Northumberland?